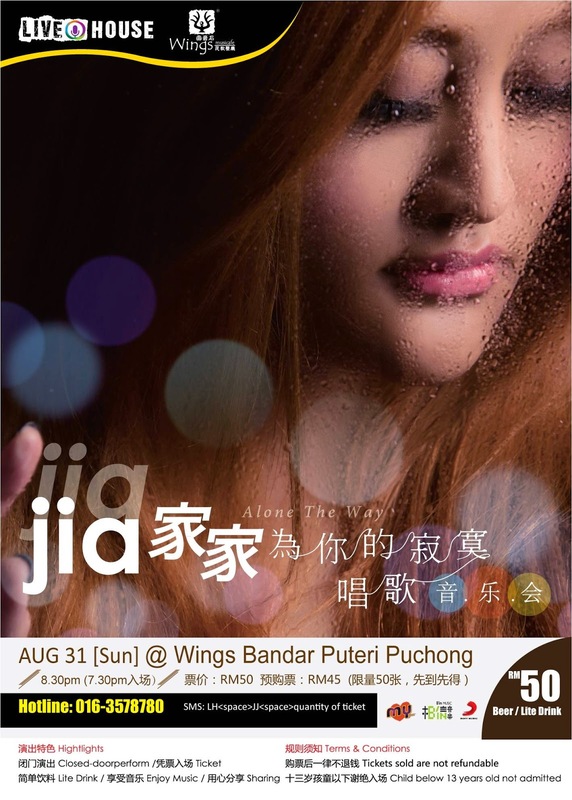 29th August 2014, Kuala Lumpur – Jia Jia, the “靈魂歌姬” will be coming over to Malaysia on 29th August 2014 to promote her latest album《為你的寂寞唱歌》. Apart from being one of the performing guests for MY FM 16th Birthday Bash 《星戰16》on 30th August 2014，she would also be bringing her musical showcase from Taipei to Malaysia Wings Musicafe Bandar Puteri Puchong on 31st August 2014 (Sunday). She will also be having her one and only Album Autograph session during that musical showcase. From <<忘不记>>、<<命运>>、<<填空>> till《為你的寂寞唱歌》one year later，Jia Jia家家 is always able to use her mesmerizing vocal to bring the listeners through different stories. Her voice is like those aged liquor which gets better and better over time and let you fall in love with it. Jia Jia家家 actually has a strong family background in Musical field, her uncle is “金曲歌王”陈建年,sister is“金曲歌后”纪晓君. Jia Jia家家 was also once a member of the group “昊恩家家”which has won “最佳演唱组合奖” with the album《Blue In Love》on 2007. Ever since Jia Jia家家joined 相信音乐 on 2012 and released her first album《忘不了》, she has received a lot of praises from金曲奖评委青睐. She has also been nominated in “第二十四届台湾金曲奖” as “最佳国语女歌手” & “最佳新人”. She has also received a positive remark on her album《为你的寂寞唱歌》and has also been nominated in 25屆“金曲奖” as “最佳国语女歌手”. Organized by相信音樂主辦，supported by回音石，MY FM as official radio station，【家家“為你的寂寞唱歌”音樂會】will only be selling a limited 120 tickets whereby each ticket is only selling at RM 50 (including a drink). Those who are interested to purchase the tickets, you can SMS or WhatsApp “ LH<Space>JJ<Space>Quantity of Tickets” , and then send to 016-3578780.